AnTherm (Analysis of Thermal behavior of Building Constructions with Heat Bridges) is a powerful program used for heat flow calculation in building construction elements - the thermal heat bridges and vapor bridges. Thermal Bridge Assessment can be executed easily, quickly and precisely with AnTherm. Having deep knowledge of the physically well-founded concept of thermal coupling coefficients and with more then 30 years of experience in development and use of thermal heat bridge applications the AnTherm has established to be very powerful but easy to use program package. The basic fundamentals of developed theory (reference provided within the book "Wärmebrücken / Cold Bridges") have been taken over into the international "thermal heat bridges" standard. Therefore it is an easy task to develop AnTherm conforming to standards and to fully satisfy validation test criteria. 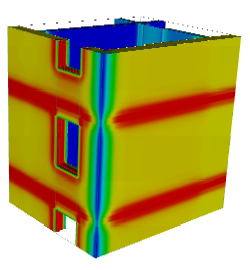 AnTherm is a powerful program package for the calculation of temperature distributions and heat flows in building structures - particularly such with thermal heat bridges (cold bridges). For the technically qualified designer, AnTherm is a reliable, indispensable tool in meeting the demands of the current European standards (EN) for evaluating thermal performance thoroughly and precisely. This Thermal Heat / Cold Bridge Simulation Software calculates the distribution of temperature, heat streams and vapor diffusion streams within building components of arbitrary form and built as composite of arbitrary materials. Furthermore AnTherm can compute and evaluate the dew point values (condensing humidity) at all component surfaces as well as partial vapor pressure in components interior. This application is also suitable for analyzing dynamic behavior of building components (for periodic, harmonic, transient boundary conditions). For the technically qualified designer, AnTherm is a reliable, indispensable tool in meeting the demands of the current standards (ISO, EN, ...) for evaluating thermal performance thoroughly and precisely. The detailed analysis of thermal bridges for passive house planning, energy efficiency assessment or certification need not be complex nor sophisticated today. 2D models can be instantly converted to 3D models. It is also possible to immediately model in 3D.